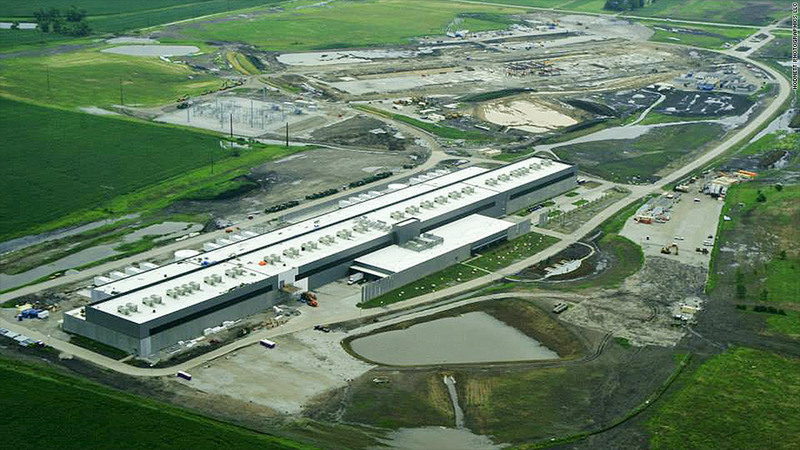 An aerial view of the Facebook data center under construction in Altoona, Iowa. High-tech data centers are growing on the plains of Iowa. These massive facilities are filled with servers and other equipment that keep Web-based services running. Microsoft (MSFT) announced plans in April to build a $1.1 billion data center outside of Des Moines, while Facebook (FB) will have one opening in the nearby town of Altoona early next year. Google (GOOGL) has a facility in Council Bluffs, and there are more than a dozen others operated by smaller companies as well. "We've really made a value proposition to data centers," said Debi Durham, director of the Iowa Economic Development Authority. "When Microsoft and Google and Facebook are all here, people take notice." The state has an abundance of cheap renewable energy. Iowa's commercial energy prices are nearly 20% below the U.S. average, and the state generates a significant portion of its power from wind farms. That's important for tech companies, because data centers consume a massive amount of power. In the United States, data centers are responsible for more than 2% of the country's electricity usage, according to researchers at Villanova University. If the global cloud computing industry were considered to be a single country, it would be the fifth-largest in the world in terms of energy consumption, according to Ed Turkel of Hewlett-Packard's Hyperscale Business Unit. Google announced an agreement in April with MidAmerican Energy to power its Iowa facilities entirely with renewable wind energy, and Facebook plans to do the same. There's also the favorable environment for delivering power. Iowa isn't subject to rolling blackouts. While there's the occasional tornado, the state isn't at risk of earthquakes or hurricanes that could take the data centers offline. Then there's the Google effect. Iowa offers a host of tax credits and other incentives to companies looking to build data centers. The credits were signed into law following approaches from the search giant, which announced plans to construct in Iowa in 2007. "Google was the first to market in Iowa, and it's not uncommon in Iowa to get someone coming in saying, 'There is a value proposition, but if you did this, it would be better,'" Durham said. Rather than extending credits specifically to Google, the state passed legislation offering sales tax rebates on electricity, computers, power infrastructure and cooling equipment purchased for use in data centers. There's also no property tax added for computers and other technical equipment at the facilities. A Google spokesman said the company "picked Council Bluffs because it has the right combination of energy infrastructure, developable land, and available workforce for the data center." The facilities don't generate a great deal of direct jobs. Google's facility has 200, according to the Iowa Economic Development Authority, while Microsoft and Facebook will have just a few dozen. The number of jobs at some of the smaller data centers, meanwhile, are in the single digits. But the data centers offer other benefits as well, said David Maahs of the Greater Des Moines Partnership, an economic development group. Among them: new investment flowing into the state, and indirect jobs in fields like construction. The tax incentives, Maahs added, are similar to those the state has used to build its manufacturing industry. "We're treating data centers almost like the manufacturers of the twenty-first century," he said.